This work consists of the study of techniques of robotics and virtual reality to develop a simulator that can be used in robotics schools, having an adequate visualization and a simple and intuitive way of interaction. 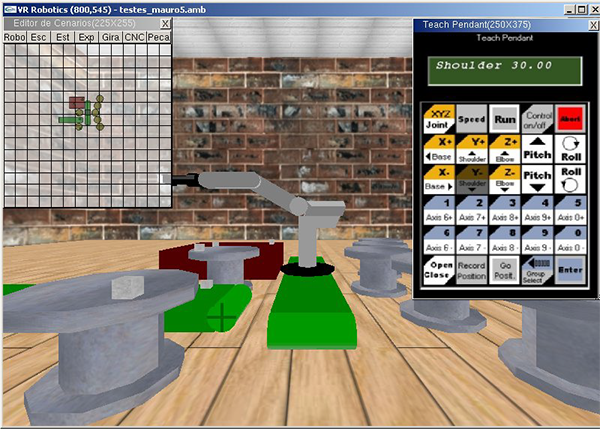 For this, a 3D virtual environment for robotics was developed. Virtual reality resources have been incorporated to improve the visualization and to facilitate the user interaction with the environment. In order to evaluate the effectivity of the environment, user experiments were carried out on four different hardware configurations. During the simulations, the users had to create trajectories while implicitly defining reference points. From these experiments, automatic reports for the quantitative questions were generated, and questionnaires were filled for the qualitative questions. 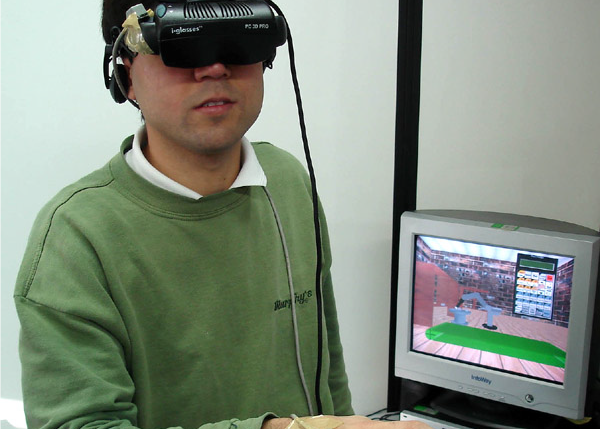 The results have shown that the use of virtual reality do helps the users in task execution, improving the visualization, reducing the time spent for the tasks and increasing the precision.